Hope everyone had a great weekend! I felt like it was a busy weekend for most people I know. My wonderful mama was in town so I spent it with good company, playing lots of card games, and consumed copious amounts of chai. 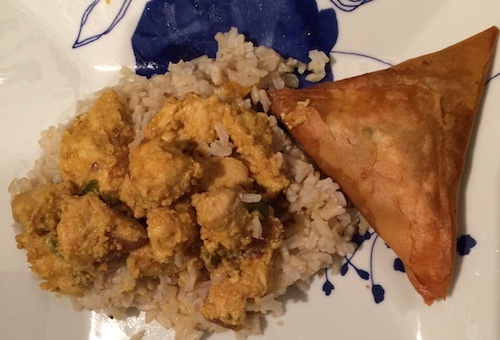 I figured I’d learn a new recipe while she’s in town, and since I was cooking for some friends when I got back to the city, she gave me a quick breakdown on how to make an Indian dish, chicken korma. In a pan, warm up the oil, and fry onions and cardamom. When the onions are transparent, add the chicken and the rest of spices (ginger-garlic paste, red pepper, cinnamon, salt, turmeric, coconut and almond), as well as the chicken and sautee. Mix in yogurt. If you want to make it more saucey, add a few tablespoons of water. 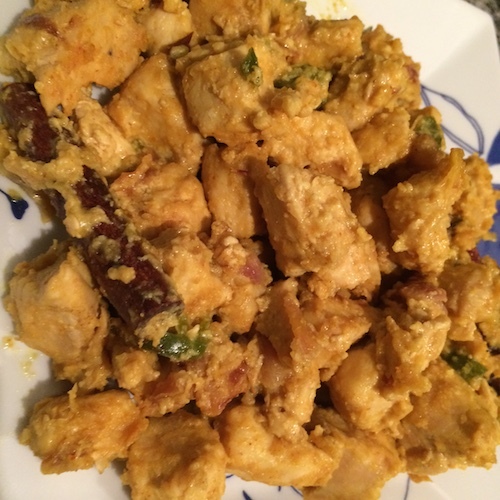 Easy dish that I made in 15 minutes, and the spices balanced out the flavors a lot. I’m sure there are a lot of different ways to make this dish, but I’m curious if anyone out there makes it differently.